Follow a sunset on a clear day against a distant horizon and you might glimpse a green flash just as the Sun disappears, the sunlight briefly refracted over a long sight-line through atmospheric layers. You can spot a green flash at sunrise too. Pinpointing the exact place and time to see the rising Sun peeking above the horizon is a little more difficult though, and it can be harder still to catch a green flash from the fainter rising Moon. 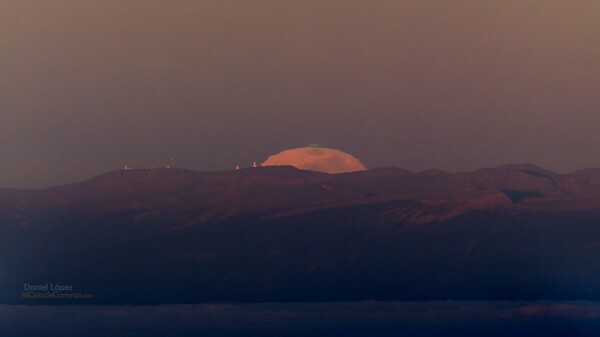 But well-planned snapshots did record a green flash at the Full Moon’s upper edge on June 2nd, from the Roque de los Muchachos Observatory on the Canary Island of La Palma. Looking a little south of due east, this long telephoto view finds the rising Moon above mountains and a sea of clouds. In sunlit profile are the mountaintop Teide Observatory telescope domes on the island of Tenerife some 143 kilometers away.